The Bury Swiss Pairs ended in a dead heat on Sunday with, left to right, John Bloomfield & Andre Gray sharing the spoils with Roger & Jill Tattersfield. The Summer League has attracted plenty of attention this year with seven teams in division 1 and six teams in division 2 playing a total of 34 matches. Ipswich and Kesgrave Diamonds were Division 1 winners with 302 VPs, followed by Colchester in second with 293. Colchester II won Division 2 and will be promoted for next year's competition. Mike O'Reilly, who organises the league, commented: "A total of almost 15 000 master points were awarded this year and special thanks are due to the team captains who spent many hours trying to organise the timetables of eight of their club players in the 34 matches. "They also had to arrange venues and sort out transport and without their excellent efforts the event would never suceed - thank you all!" Peter Brown and Bob Kemp are the wide-margin winners of this year's renewal of the Suffolk Simultaneous Pairs. Playing at Ipswich Hospitals bridge club, they recorded a county wide score of 72.30%, well clear of Richard Evans and David Unwin from Stansfield (65.37%, with another gap back to Jane and Pat Hudson (62.89%) from Deben in third. The highlight of the winner's success was 7NT bid and made on Board 20, a feat matched by only one other of the 138 pairs who took part. Nine clubs participated: Abbeygate, Clacton, Clare, Deben, Framlingham, Hadleigh, Ipswich Hosptials, Stansfield and Woodbridge. Peter Bushby co-ordinated the scoring in addition to writing a commentary on the boards played. Click on SIMS to see all the results and COMMENTARY for analysis of the boards. After the dead-heats of the Felixstowe Congress, the Championship Teams at Nayland produced wide margin successes. The event attracted 12 foursomes on Sunday and following a qualifying heat, seven contested the main event while the remaining five played for the Suffolk Plate. The team of Mike Sherer, Chris Green, Rick Hanley and Peter Sutcliffe (below left) finished a distance clear of David Price, Jane Moore, Cleopatra Hensby and Jenny Price in the main event. The top four teams now take part in a knock out to determine the overall winners. It was a similar story in the Suffolk Plate, with Joan Watson, Mike O'Reilly, Patsi Barnes and Peter Bushby (below right) well ahead of Richard Evans, Susan Nisbett, John Bloomfield and Celia Jeal. Results: Click on ROUND 1 and ROUND 2 and PLATE. Click on PICTURE GALLERY for views of the day. In the semi-finals, Hanley will host Edwards/Carey and Price will host Talaga. VICTORIOUS: (l-r) Peter Sutcliffe, Din Gudka, Malcolm & Karen Pryor, Chris Chambers, Cathy Rowland, Peter Gemmell and Chris Green. Ipswich & Kesgrave produced a stunning performance to run away with the Suffolk Club Teams of 8. After building up a big lead by half-time, they finally won by 30 VPs, eqivalent to a match and a half. A strong Clare line up finished second with near neighbours Stansfield taking third spot, ahead of Bury and Colchester A. This event is invariably popular - a maximum field of 12 teams took part - and a contributory factor is the wonderful tea at half-time prepared by the local sea scouts. The supremacy enjoyed by I & K was reflected in the X-Imps table in which three of the clubs pairs - Peter Sutcliffe & Chris Green, Din Gudka & Cathy Rowland, and Peter Gemmell & Chris Chambers - filled the top three spots while the other pair, Malcolm & Karen Pryor, were fifth out of 48 pairs! To see a breakdown of the finishing positions, the teams, individual match scores, the boards played and the X-Imps table, click on RESULT. Click on PHOTOS for more views of the event. In the 38 year history of the Felixstowe Congress, the results have never been as nailbitingly close as those witnessed in the latest renewal. Both the main events - the Championship Pairs on Saturday and the Swiss Teams on Sunday - ended in dead heats, as did the contest for the leading 'Non-Expert' team. Because trophies are awarded for all three events, Rob Sassoon, the chief tournament director, and Jeff Orton, the SCBA chairman, spent overtime poring over the rule book to work out who were the outright winners. The outcome was determined by how the contestants who tied for first place performed against each other during their respective competitons. Every card, every board, every score counts. And never more so than on Sunday at the Felixstowe Congress. With a live screen showing the running results in the Swiss Teams, numerous players watched in suspense as the final scores were posted - and resulted in two dead heats. The two teams sharing first place were last year's winners - Eric Newman & Diane Whitley, David Willson & Simon Riley - and (pictured top left) Norman Less & Helen Mason, Mike O'Reilly & Peter Bushby. And a little further down the results two other teams were in a dead heat for the 'Non-Expert' prize - awarded to the leading team whose members are all below the rank of National Master. Rob Sassoon and Jeff Orton consulted the rule books and determined that the Helen Mason team were overall winners while the 'Non-Expert' prize went to the Stansfield quartet of Paddy Lockwood & Gerry Ford, Kathy Rose & Penny Easting (centre photo). The Really Easy Pairs, which is contested by less experienced players who have won less than 1,000 Master Points, did not require a judge to determine the outcome. Alison & Conrad Simons (pictured right) put clear daylight between themselves and runners-up Sheila Boxshall & Mark Leggett. Gary Diamond & Russell Tenzer won the Suffolk Championship Pairs at the first time of asking - with a helping hand from Mrs Tenzer. The north London pair only decided to head to Felixstowe after Russell got a 'free pass' to attend. “I have never been allowed to go away for a bridge weekend before but she is away learning bridge with her club this weekend so I was able to come here. Gary and I did some research and found that the only congress was on at Felixstowe." The duo, who normally play their bridge at Pinner and the MCC bridge clubs, won by the narrowest margin. They tied for first place on 62.12% with Paul Darby asnd Gabriel Ip from Norfolk, but won on a countback. Earlier in the day, David Willson & Simon Riley from Stowmarket finished top of the 62 pairs who took part in the Pairs Qualifier. The Consolation Pairs was won by Ipswich pair Cathy Rowland & Din Gudka while the Open Pairs was won by Sandra Nicholson and Krys Kazmierczak. Scroll down the right hand column to Results and click on the relevant event. A card play technique highlighted by Andrew Robson during a Masterclass held locally provided the answer to playing a tricky hand at the Ipswich & Kesgrave bridge club. Suffolk captain Rick Hanley explains how. Click on ANALYSIS to read more. Suffolk's Malcolm Pryor will play in the World Bridge Team Championships (D'Orsi Bowl) in China next year after the England seniors finished eighth in the European team chamionships. The full team representing England will be John Holland & Alan Mould, David Muller & Malcolm Pryor, Peter Shelley & Trevor Ward. NPC: David Jones. The event takes place at Wuhan, Hubei Province from 14-28 September. The qualifying rounds for the Tollemache Trophy, the national competition for county teams of eight, took place at the weekend. Suffolk finished seventh in their group and thereby failed to make it to the finals. Click on Table, Results and Cross Imps for more details. Click on TOLLEMACHE to read captain Rick Hanley’s report. Sarah & Nick Farr (top right) are the new winners of the Ringer Cup after finishing top of the Suffolk Mixed Pairs at Lavenahm. The pair from Clare - where Sarah is Chair - finished ahead of Nancy Williams & Paul Maclachlan from Stansfield in second spot. Din Gudka & Cathy Rowland and May Li & John Gan tied for third place with May & John (bottom right) winning the Lang Cup for the highest placed married couple (excluding the winner). The event attracted 12½ tables, thereby continuing the healthy upward trend in entries to county competitions. To see all the scores and boards played click on MIXED or go to the right hand results column and click on the relevant date. Andrew & Jane Moore (left) added to their remarkable record in the Suffolk Senior Pairs when they won the title once again at Clare. The local pair lifted the Stokes Trophy in 2013 and 2016 and, in addition, have won the event playing with other partners on at least six occasions over the past decade. Cathy Rowland & Din Gudka, who won 12 months ago, were runners-up ahead of Christine Cooke & Roger Bacon in third spot. Roger & Jill Tattersfield (right), who finishned fourth overall, won the Veterans prize for the top pair aged 70+. Roger & Jill Tattersfield focus on two intersting hands from the Senior Pairs. Please click on ANALYSIS to read their thoughts. Are Handicaps, earlier starts and multiple locations for competitions the way forward? A meeting of representatives from clubs throughout Suffolk produced a series of proposals aimed at boosting county events in the years ahead. 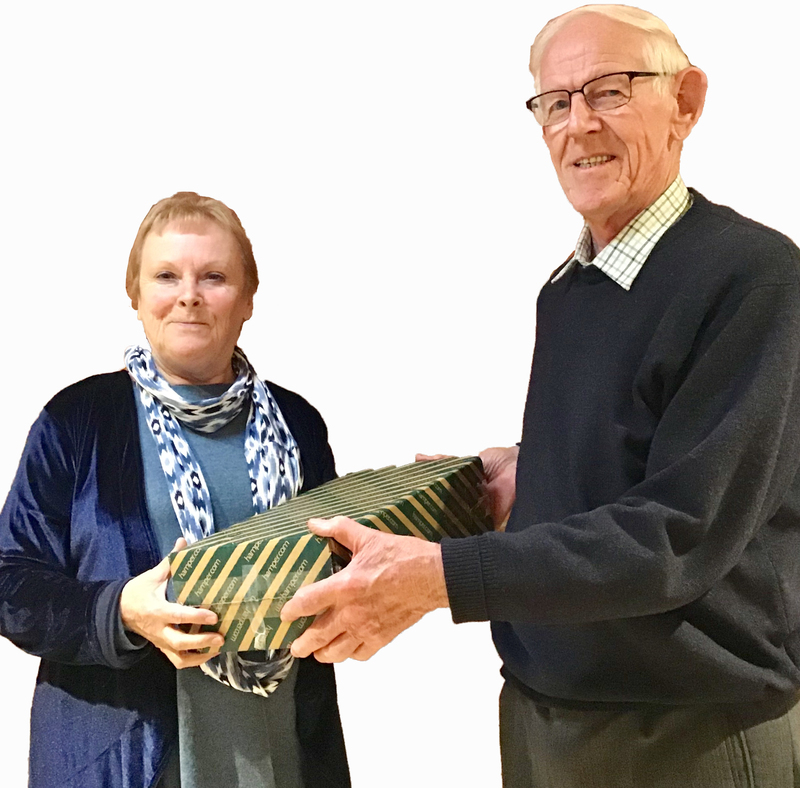 The gathering orgainised by the Suffolk Contract Bridge Association at Elmswell was the first of its kind for seven years and attracted more than 30 people. The topics covered during the four hour session included county competitions, bridge websites and the internet, county directing, teaching and attracting new members, junior bridge and membership records. Several suggestions to boost attendance included having Handicap events, similar in concept to those in sports such as golf and horse racing, where weaker partnerships receive a percentage start based on their respective NGS grades. All pairs would have an equal chance of success. Jeff Orton, chairman of the SCBA, said afterwards: “I was particularly impressed with some of the constructive comments from the club representatives, especially those concerning improvements to the county's programme of events, teaching, and attracting new members. Click on MEETING for full coverage of the event, including a junior bridge initiative being pioneered by Carol Smith. A survey has been conducted into why people play bridge, with researchers at Stirling University analysing responses from more than 6,000 players. The study, undertaken in association with English Bridge Education & Development, has resulted in a 24 page report whose conclusions are hardly earth shattering. “Overall it was found that people play bridge because they enjoy it – either it is fun, or they enjoy the challenges the competitive game presents, and that it provides a sociable and friendly atmosphere,” the report concludes. The third Suffolk bridge lunch attracted 40 players from all over the county. A fabulous two course meal and wine, prepared by Gerry Ford and his daughter Emma, was followed by 27 boards. Richard Evans & Paddy Lockwood from Stansfield finished top ahead of Jan Wynne & Jim Sawyer, with Jill & Roger Tattersfield. Many thanks to Jill for organising another successful event and to Gerry & Emma for a delicious lunch. To see all the scores and boards played click on RESULT.